What this model sets out to achieve is to further breakdown goals and assists which can be slightly misleading as standalone stats. Your striker may have 15 goals this season but to what extent do his goals matter if they are all scored late on in games when your team are already winning 4-0? By the same logic, when recruiting a player who has ten goals if they are all game winners that would provide some insight into how he performs when the game is on the line that may add to his value somewhat. As you can see Toni Kroos of Real Madrid runs away a worthy winner of the assist importance award. At the time of writing Toni Kroos has 10 assists this season so not only does he have the most assists in La Liga but the importance of those assists eclipses any player in Europe’s top 5 leagues. Ladislav Krejci sits in second place with a remarkable average of 7 from 7 assists so to put it in more laymen’s terms each assist by Krejci equates to an importance of just under a winning goal assist every time he assists and that again makes Kroos’ output even more impressive. 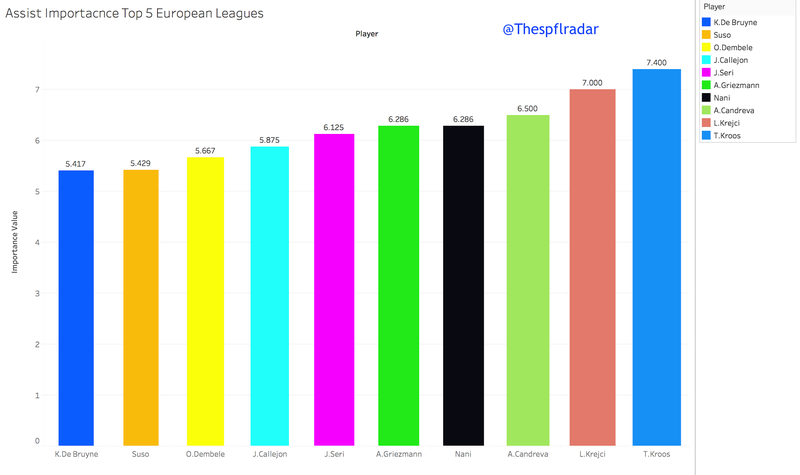 Others worth mentioning in the assist leader in Europe – Kevin De Bruyne. The talented Belgian sits 10th in assist importance with an average of 5.4 which equates to more than an equaliser every time he assists which is a high standard considering he leads Europe in Assists at the time of writing. Finally, Ousmane Dembele. The sole teenager on the list. At the time of writing he has 9 assists in his rookie season in the Bundesliga with Borussia Dortmund. For him to make the top 10 in importance value aswell gives a bit more value to those who rightly rate him so highly. All stats correct at the time of writing.